Although it is often viewed as a radically new idea, the vast majority of parents in this country have been participating in a system of school choice for years. For example, there are more than 40 school districts in the Dallas/Fort Worth metroplex. Assuming each district has at least two campuses at each grade level, a typical family has a choice of about 80 public schools — provided the parents can afford to buy a house in any neighborhood and are willing to drive a considerable distance to work. How well does this system work? Better than you might think. Two decades ago, a study by researchers at Southern Methodist University and the Dallas Federal Reserve Bank found that North Dallas houses near higher-ranking elementary schools sold for about 20 percent more than houses near lower-ranking schools. The authors concluded that the market for education works surprisingly well. Parents can discern quality and the market charges a premium for it. This conclusion was supported by an informal survey at about the same time conducted by Dallas attorney H. Martin Gibson. Highland Park is a wealthy suburb of Dallas and most Highland Park homes are inside the Highland Park Independent School District (HPISD). However, a few of these homes fall within the Dallas Independent School District (DISD). Gibson found that, all else equal, homes on the HPISD side of a street sold for 24 percent more than those on the DISD side. This implied that many homeowners were paying about $72,000 just for the right to send their children to Highland Park schools. If the system works well for those who have money, how does it work for those who don’t? What happens to families who cannot afford to buy a house or don’t even own a car? Since the current system in Dallas and across the country rations educational opportunity through the housing market, it’s almost inevitable that the children of low-income families will end up in schools no one else wants to attend. These are the schools with the worst teachers, the worst principals and the lowest test scores. A compounding factor is that parents who can afford more expensive homes tend to be much more adept at dealing with public sector bureaucracies. If a bad teacher or principal is identified at a school in a wealthy neighborhood, parents typically will complain until that person is transferred to another school. Then the parents at the next school will likely complain. This transfer process will continue until the worst teachers and worst principals wind up at schools where either the parents don’t complain or nothing happens if they do. These invariably are schools in low-income neighborhoods. If low-income children are lucky enough, they can benefit from another type of school choice. Long before there were charter schools, there were Magnet schools -- created by federal judges for the express purpose of luring white kids back to the inner-city. For many years, these were the only public schools that actually competed for students and almost everyone admits they work and work well. How are Magnet schools different from charter schools? Magnet schools are allowed to specialize in certain subjects (math and science, music, etc.) and they can select their own student body – just like colleges and universities. 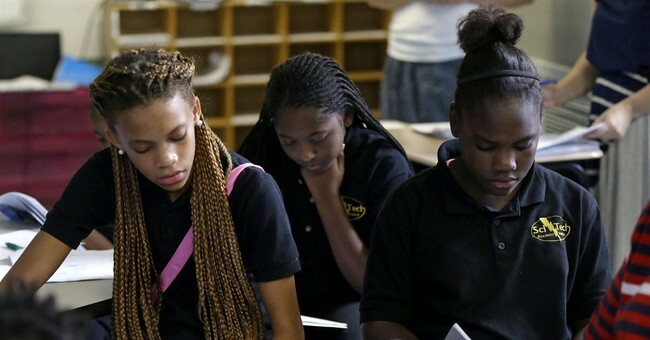 Charter schools, by contrast, select their student bodies by lottery almost everywhere. This is because charter school advocates have allowed their teacher union opponents to buffalo them into accepting a myth: the idea that a school should be equally good at educating all students. Last time I looked at the data, there were only a handful of DISD schools that fit the myth. Among the others, schools that did well with Hispanic students often did poorly with black students – and vice versa. Schools that were good with boys were often mediocre with girls. Schools that excelled in teaching slow learners were often no good at helping fast learners. There is another myth that the teachers’ unions propagate: the idea that public schools must take all the problem students while private schools are free to focus on children who are easy to teach. In truth, public schools all over the country are contracting with the private sector for their “worst” students. Barbados (95% black or mixed race) is a Caribbean country where high schools are like colleges. They can specialize in subject matter and they can accept or reject students as they wish. If you go there and talk to any taxi driver, you will find that the parents are very involved in these choices. And the system works: Barbados regularly sends high school graduates to some of the best universities in the United States. Our current system works well for the top half of the income distribution. Like Barbados, we need to extend those choices to the bottom half.